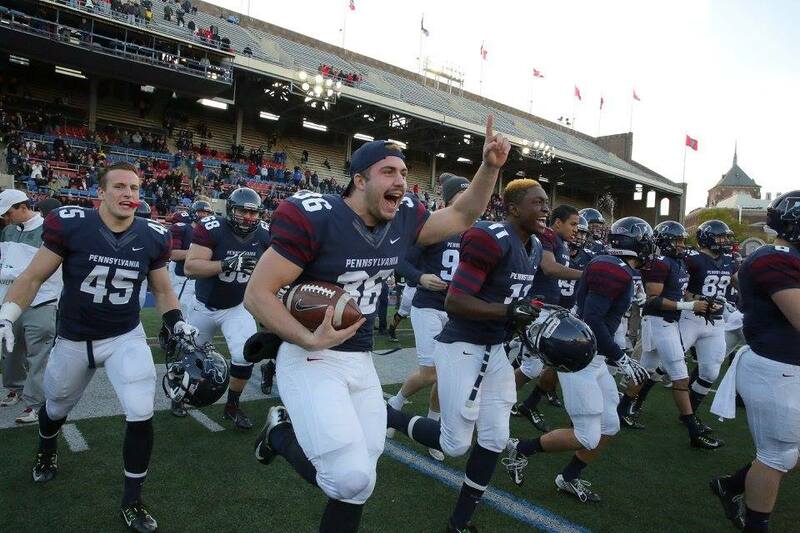 The good thing about Penn scoring three touchdowns in the first half of the first quarter of Saturday’s game vs. Cornell is it gave spectators at Franklin Field ample time to prepare for the upcoming Ivy League championship celebration. Maybe that meant thinking about how the Quakers got to this point after starting the season with three losses in its four games, including an ugly rout at the hands of Dartmouth in the league opener. Or how they improved so dramatically from the team that went 2-8 last season or 4-6 the year before that. Or, perhaps most of all, how Penn found such new life under first-year head coach Ray Priore, who seemed to push all the right buttons in taking the mantle from the legendary Al Bagnoli. Whatever it may have been, it was a sweet day at Franklin Field on Saturday as the Quakers dominated early and then ran out the clock on their sixth straight win to capture a share of the Ivy League title, along with Harvard and Dartmouth. And of all the 17 championships the program has won — 10 coming with Priore as Penn’s longtime assistant coach — this one may have been the most improbable. “They probably don’t realize what they accomplished,” a smiling Priore said in the postgame press conference, shortly after the students rushed the field and players smoked victory cigars. And though he wouldn’t say so himself, Priore is a big reason why that grittiness manifested itself over the last six games when the Quakers could have so easily packed it in. 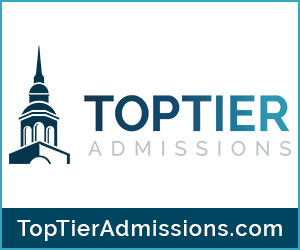 He hired a couple of great coordinators to bolster the coaching staff after Bagnoli left for Columbia and took a couple of assistants with him. 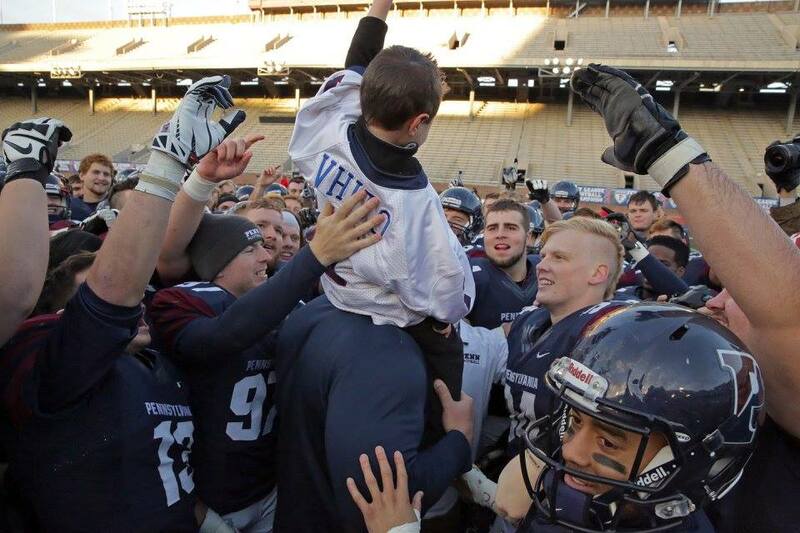 He inspired his players by bringing aboard 4-year-old cancer patient Vhito DeCapria as the team captain. He put a lot of trust into young players such as sophomore Justin Watson, who became just the third player in Penn history to amass 1,000 receiving yards in a single season. He modified the practice schedule and made a big push on nutrition and health (the team had far less injuries this season than they had over the past two seasons). 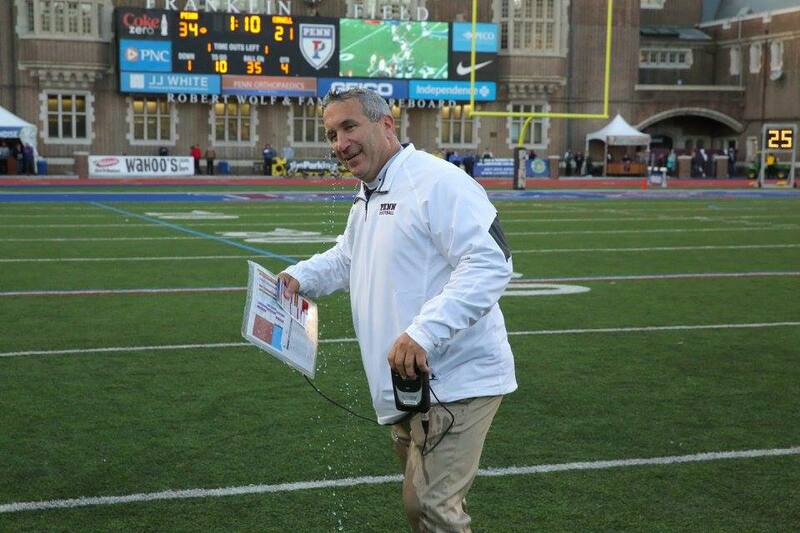 He led Penn to its first win over Villanova in 104 years. He walloped his old mentor to start the six-game winning streak that saved the season. He snapped Harvard’s 22-game winning streak on the road. 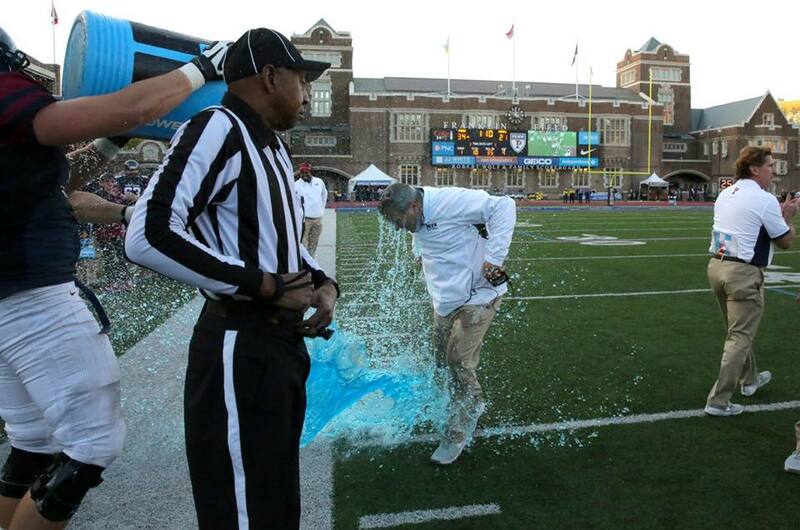 And, in the end, he had a bucket of Gatorade dumped on his head at Franklin Field, the place that’s become a second home to him and his family over the past three decades. Moments later, Priore and the players got up and left the room, the celebration surely continuing into the night. But maybe not too long. He deserves a long nap. But something says he’ll be back on the recruiting trail very soon.